Group of Mobilink volunteer employees at the ceremony organized by Mobilink to mark International Volunteer Day. Seen in the picture are Omar Manzur, Director Public Relations & Corporate Social Responsibility, Mobilink, Dr. Ahson Rabbani, Vice President Inputs, The Citizens Foundation and Mansoor Sarwar, Program Office Philanthropy Services, Pakistan Center for Philanthropy. On the eve of International Volunteer Day (IVD), Mobilink commemorated employees for maintaining the spirit of volunteerism throughout the year. Designated by the United Nations since 1985, IVD is celebrated every year on December 5. The declared aim of IVD is to thank volunteers for their efforts and increase public awareness on their contribution to society. Employee volunteerism is a core value of Mobilink’s Culture of Excellence and employees are strongly encouraged to develop a humanitarian spirit. This is why Mobilink employees are sanctioned to clock an average of 4 to 5 dedicated hours per person per month during official working hours. The volunteers spent over 3,000 hours in 2008 in community service and have already clocked in 4,800 hours this year. A key activity in 2009 was employee involvement in collection, procurement and distribution of relief items for Internally Displaced Persons (IDPs) of the Swat and Malakand District. Through their efforts, Rs. 3.5 million worth of essential relief goods were distributed to over 15,000 IDPs. This is in addition to the Mobilink Camp, set up with a Rs 81 million fund for 1,000 families of IDPs, also established and managed by a team of Mobilink employees in consultation with Emergency Response Unit and implementing partner agencies. Outstanding volunteers were awarded trophies whereas certificates of appreciation were also distributed among the highly motivated Torchbearers to recognize their relentless efforts. 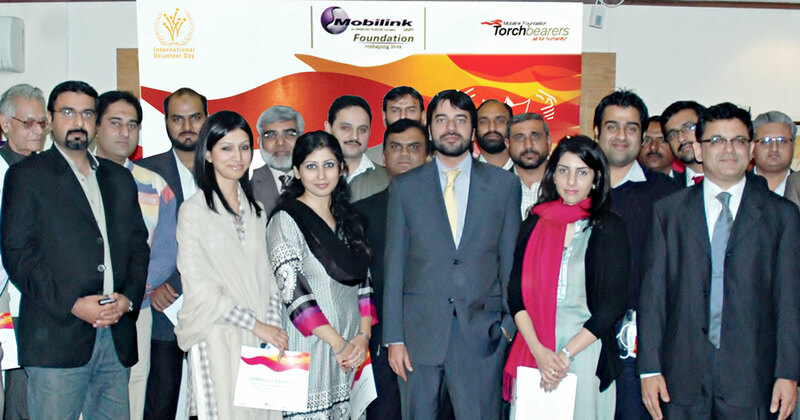 Torchbearers in other cities were also appreciated through similar ceremonies organized by Mobilink to mark IVD.